Late on the night of September 9th, 2012, I was sitting at my kitchen table, going over notes for a piece I was writing about video game arcades. The next morning at 6AM I was bound for an Amtrak train which would take me to Pennsylvania, then to Baltimore, on a four-day trip of interviews for the piece. I was packed and ready for bed. I was exhausted, and as I brushed my teeth, thought of the next day’s work. I’d like to be able to say that I went peacefully to bed, my iPhone tucked underneath my pillow as I was wont to do, but that isn’t what happened. What happened, instead, was a series of events involving my phone, a toilet, and a bowl of rice at 1AM. As I removed the SIM card from the phone and buried it in rice, still vibrating and refusing to power down, I didn’t know that my phone was definitely, totally, completely dead. In horror, I quickly and hastily chose from among the dozens of tester phones I am routinely surrounded by. I passed up a Windows Phone as too foreign since I have so little experience with them, and settled on a European version of the HTC One S. It was bigger than my iPhone, which I didn’t like, but it was close enough in size that I thought I could manage for the unavoidable four days of hell I was surely in for. After all, traveling with a brand-new phone when I’d need access to my emails, maps, music, and text messages with only minutes to make the switch was not ideal in any way. I went to bed afraid and confused, angry at myself for dropping my phone into a toilet. As I struggled to figure out how to set the alarm on this dreaded device and silence its notifications, I cursed it openly. This was my introduction to Android. I was suspicious of sizing up: I assumed that my days of multitasking one-handed were over, and they were. The One S wasn’t mine and it wasn’t an American phone, which seemed to cause it occasional data problems, but, other than that, I loved it. I got on that Amtrak train on September 10th groggy and acutely aware that I was going to be uncomfortable with my phone for the duration of the trip. But I was wrong. By the end of the trip I was emailing other Verge writers, effusively praising the glories of Android. Rdio worked beautifully! The notifications were so much better than the iPhone’s! My email, oh God, my email. I composed long, beautiful emails in dead spots where I had no service and it quietly sent them later on. The Twitter app seemed... better. It loaded faster, I thought. The battery life was better than my iPhone’s. I could effortlessly Gchat, 24 hours a day! Editing documents on my phone was something I could actually do realistically now. Oh, and the maps put the iPhone 4 to shame. There were other, smaller things, too, but I can’t remember them, because it’s now been so long since I touched an iPhone. The most important thing was that the transition, which I’d sort of wanted but feared for several years, was seamless, mostly because I already used so much Google stuff. This should come as no surprise to switchers and long-time Android users, but it did to me. I’d messed around with Android phones over the years, but had lazily stuck with iPhones, consistently, since their debut back in 2007. There were plenty of things I didn’t like about the iPhone, but I’d never encountered anything I considered a deal breaker. Nothing but absolute force made me change. And when I did change, I never looked back. I didn’t even try to turn my iPhone back on when I got home four days later. In fact, I didn’t try to turn it on for about six months (it’s dead, as I suspected). And, while I’ve been actively window shopping for a phone to call my own since last September, I never once seriously considered buying a new iPhone. A few months ago I started saying that while I loved Android, my ideal Android phone didn’t exist for AT&T. Let me describe it: It’s an Android phone, made by HTC, and it’s about the size of an iPhone. It has LTE. The size was really the one remaining annoyance, I guess. Though I’d adjusted just fine to the extra height and width of the One S four months ago or so, I still had it in my head that the ideal phone for my smallish hands was roughly... iPhone sized. Enter the Facebook phone, also known as the HTC First. No phone could fit my wish list more perfectly, and once I realized that the Facebook veneer was optional, I assumed this would be my next phone. Finally, I thought, someone woke up and made what I’ve been dreaming of! And it's HTC! HTC whose Beats by Dre (don’t laugh, they rule) I adore and now require, whose hardware is, in my opinion, the best in the industry, whose Sense skin I actually really like. Thank you, HTC! But I didn’t buy it. Instead, I decided to give the also-brand-new HTC One a spin. 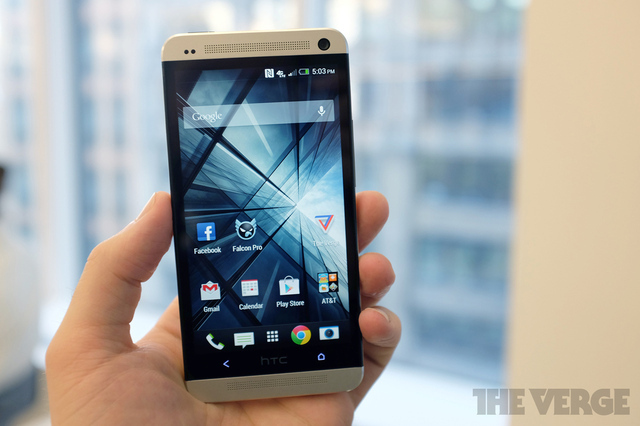 The One is HTC’s newest, beautifully designed and built flagship Android phone. Sure, it has some weird home screen stuff on it which made me mad to look at, but it was easily disabled, leaving me with Sense, which as I said, I’m a fan of. The One was also quite large by my standards and I assumed that I wouldn’t want to buy one because of that. Again I was wrong. Now, it’s not like this phone is giant, but it feels different, and it takes some getting used to. The first few days were uncomfortable, and I thought about going back to the One S until I found a phone I wanted to commit to. I briefly thought, "I should just get that Facebook phone," as my thumb struggled mightily to reach the notification drop down one-handed. By the end of the first week, though, I had adjusted. There were some things that I knew I wasn’t willing to budge on that would make it hard for me to abandon the One: First, the screen, which is large, is also incredibly beautiful; it’s beautifully built, and it seems to be indestructible, though I haven’t tried dropping it in a toilet... yet. The truth is that while I spent months imagining — and talking about — a phone which was exactly the HTC First, I was all the while adjusting to a different and better reality: that of a slightly larger phone. The smaller "iPhone-sized" dream was just a red herring. It’s been almost eight months, and one month ago, I finally relinquished that HTC One S, trading it in for the much larger, but very similar, HTC One. Here’s the thing: I’m probably a pretty standard smartphone user, in that I find something I like and I stick with it. I don’t switch phones every few months or even every year. Change isn’t hard, it’s just not something I’m interested in. I go with what works, and I think that’s what most people should do. 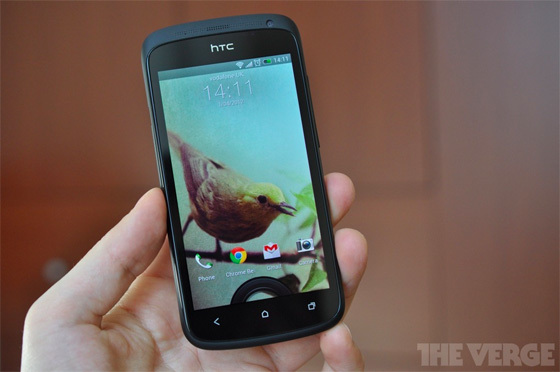 I’ve had five phones in around seven and a half years, counting the few months I used the HTC loaner. But it’s an inescapable reality that despite myself, I’ve once again adapted to the modern world. It turns out I was wrong: the phone didn’t need to fit my hands, my hands needed to learn to stretch.